Organisms embedded within food webs must balance arms races with their predators and prey. For venom users, venom may mediate each arms race, but the dynamical evolutionary changes in venom production in response to the two arms races are still poorly understood. Here, we use a simple model to evaluate the evolutionary response of a venomous consumer to the presence of an apex generalist predator and evolution of the consumer’s prey. We find that introduction of the apex predator can weaken the arms race between the two lower trophic levels. In addition, when consumer prey capture and predator defense venoms functionally overlap, a reduced evolutionary response in the prey population can drive investment in venom used for prey capture going beyond what is optimal for subduing prey. 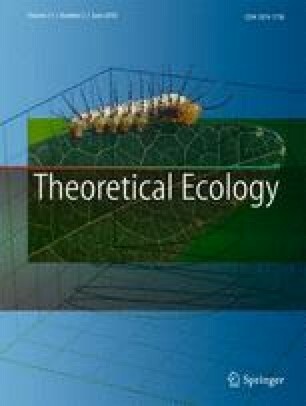 These dynamics suggest that interactions with multiple trophic levels can substantially alter the venom complexity in predatory venomous animals and may explain the paradox of the overkill hypothesis. The online version of this article ( https://doi.org/10.1007/s12080-017-0354-z) contains supplementary material, which is available to authorized users.